Every bow season ends with me reflecting on what I should or shouldn’t have done. Bowhunting is far from an exact science, but when you spend all year preparing for something that’s significant to you, you can’t help but strive for perfection. This is especially true when that trophy animal pops into view. Interestingly, I’ve found that years of experience is no sure cure for eliminating bad judgement calls in the face of solid shooting opportunities. So, exactly how do you overcome certain high-pressure mistakes when the chips are down? I’ve found that mental do-overs and lots of situational bowhunting practice on the range can train you to react more effectively. I believe this strategy helps me go on master autopilot when it counts the most. Here are five common mistakes made during the moment of truth, and the steps you can take to handle these scenarios. This is key in a treestand or ground blind. Do not let your guard down, at least not during those critical dusk and dawn moments. 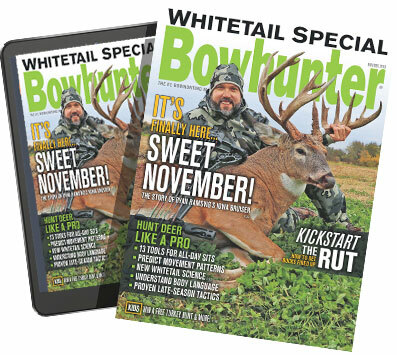 Think back to those encounters when a big buck came waltzing down a game trail as your bow was out of quick reach. I learned this the hard way one fall when a big Iowa buck came trotting past my stand right at midday and then stopped to look around. Unfortunately, my bow was hanging from a hook, and the deer vanished before I could grab my bow and clip my release to the string. After letting this same thing happen time and again, I grew smarter and began keeping my bow on my lap, or on a vertical bow holder mounted to my treestand platform. No matter how you do it, be sure you can reach your bow quickly, and with as little motion as possible. Also, if you use a wrist sling, keep it super loose, so you can slip your hand into the grip lickety-split, even with a glove on. Practice this over and over until it’s second nature. This seems to happen to the best of us. One minute the buck is out in the open, broadside and within your effective range. And then, just like that, he takes a 90-degree turn and steps into cover, never to appear again, at least not until the eyes of another deer, or an errant wind, foils your entire plan. The point here is to take the first high-percentage shot — not the perfect hallmark opportunity. This could mean a challenging shot, but if you can make it, then I say don’t dawdle. Take the shot! This exact misfortune happened to me on my last Nevada backcountry hunt. It was midday and I was easing along a ridgeline, glassing down into cool aspen thickets in hopes of finding a buck bedded in cover. After about 30 minutes of still-hunting, I spotted a nice 4x5 buck lying in his midday slumber and looking away. I snuck to within 50 yards of the buck and then watched him get up to feed. I waited for the right shooting angle, and when he turned quartering away, I hesitated. I felt I had all the time in the world, and figured the buck would move closer for that golden opportunity. Then a freak thunderstorm rolled in and sent a swirling thermal into the deer’s nose. One whiff of me and he was gone — along with my best opportunity of the hunt. That hurt. I would never advocate taking shots that are unethical, or overly challenging. However, if that “green light” suddenly registers in your mind, I say don’t dawdle. Trust your instincts and get to full draw. With certain animals and in certain conditions, you must draw your bow without being seen. To overcome this common error, be proactive and ease into full draw well before you expect the actual shot to develop. For example, if you see a big bull elk working his way in from 70 yards out, cycle your bow as he passes behind the next clump of trees, even if you don’t plan on taking a shot until he gets to within 35 yards or less. This way, once he enters the wide-open meadow in front of you, you’ll be locked on at anchor, ready to take the shot. He won’t see a lick of movement, other than a flashing arrow moving toward his vitals. Practice holding your bow longer and delivering an accurate shot until it becomes second nature. Once that big buck or bull appears, it’s easy to lose your mind and forget to pick a spot. Even experienced bowhunters can forget to focus on a small patch of hair, a crease, or an imaginary bull’s-eye on an animal’s vitals. This is very important for two reasons. First, it will give you something to busy your mind with as you activate your shot sequence. Second, it will maximize your margin for error. Aim small, miss small! Realistic 3-D practice is the best way to perfect this technique. This type of training puts you in regular hunting clothes, with your binoculars and rangefinder strapped to your neck, and taking unique shots from a treestand, ground blind, or from stalking positions such as from your knees, or while sitting down behind a clump of tall grass. Prior to taking shots, force yourself to visualize that big buck or bull elk stepping into your effective range. Examine the detail heavily, and begin that tunnel-vision focus on his chest area. See the hair, muscles, and that precise area above the armpit. Pick out a discoloration of hair at the center of the vitals, and then picture yourself aiming, squeezing through the shot, and watching your arrow impact perfectly. Do this over and over until it becomes habit. Missing a deer due to an arrow that glanced off a tree branch is common stuff. It’s usually due to the bowhunter not being able to see the obstruction because of low light. Or it’s due to complete “pilot error” from being overly excited and not verifying a clear arrow path. The best way to solve this is to look intently for shooting obstructions prior to shooting — using optics if necessary — and making sure it’s an integral part of your pre-shot mental checklist. For example, imagine a deer standing 45 yards away, with a tree branch shading its vitals between you and the deer. Can you still take an ethical shot? The best way to solve this is to hold your bow up, aim with the appropriate sight pin, and note the position of your other pins to determine if your arrow will collide with the tree branch. With a single-pin sight, this becomes more difficult. In this case, it’s up to you to learn the trajectory of your arrow. The best place to work this out is on the practice range using a 3-D target. 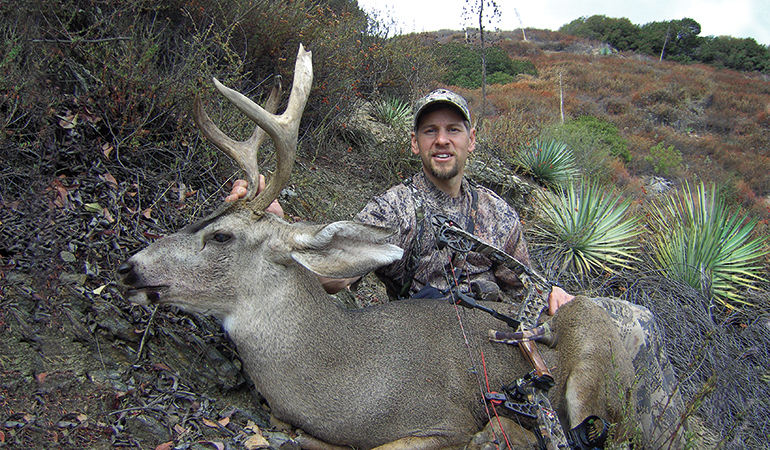 Bowhunting is an intense sport, and it’s easy to make simple mistakes, especially in the face of a shot opportunity. The problem is good shots — not perfect ones — only come around so often. That’s why you must train for every situation, over and over, until you find a proven technique. These tips have worked for me in minimizing common bowhunting blunders, and I have no doubt they’ll work for you and enhance your effectiveness.